1. Blanch bok choy in boiling water for 30 seconds to 1 minute. Pat dry. 2. Heat sesame oil in a wok. 3. Add garlic, chili and ginger then stir until fragrant. 4. 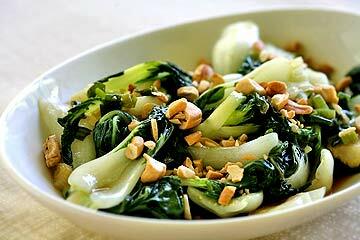 Add bok choy and stir until thick stem softens. Stir in cashews or peanuts. Serve and enjoy!